Hey! You! This is the 900th one! Woah, there! Has it really been 100 full days/ideas since our octocentennial? Yes. Yes, it has. You can count them up if you don't believe me. So we've now reached 900. That is to say, if you were try to make a phone call to Elderly Apple, you'd have to pay a premium fee. I think. ....Sweet deal! Oh, before moving forward, let's look back at all of my prior centennials. These have all been opportunities for me to try things different from the way Elderly Apple normally goes. Looking behind the scenes, trying out full-length comics, looking at future comic ideas. There's been a wide range of things I've done. What are we going to do on what is, effectively, my last centennial before we reach the end? After some consideration, I thought to myself, "what if I had a totally different format?" There are certain "rules" that are adhered to here. And no, I'm not talking about the "everyone has dark brown shoes" rule, I mean things like "always hand-drawn images", "never any dialogue in the image", etc. One of these rules is that, while I can hint towards certain stories within each comic, through my comment, HTML tag, or image itself, I am not creating a narrative. That is the job of the reader, to take what is there, and create the world around it. After all, Elderly Apple is about imagination, so it is my intention for people to use theirs. So this explores that direction. Namely, I decided to take three random ideas, spanning the previous 900 comics, and change them up a bit, offering a glimpse into a parallel dimension: What if Elderly Apple had been a noir story comic? What if every image were a catalyst for a fully-written story? What if it were incredibly depressing? That's right, depressing. Why? Eh, why not? A few years back, I wondered to myself, "how could someone be the most depressing person ever?" They weren't supposed to be depressed themselves, just depressing. One such idea was to have them live in a home where the theme to Ken Burn's Civil War was played on a nonstop loop; after the third or fourth time, even the strongest amongst us would break down and sob. Or have them talk about our minuscule place in the grander universe. I imagine you could easily do the same type of things with comics. Life's a gamble. Sometimes you get that small victory, that little piece of success that makes you think, "Yeah, that's it. Maybe I can make it. Just have to play another hand or two." But in the end, the house always wins. Always. Your parents tell you that you're worth something. Heh, you even have your worth stamped on you. Blues are worth ten bucks. Greens, fifty. Purples are a cool hundred. And we reds are supposed to be worth five bucks. Supposed to be. I say that because looking around the neighborhood, the truth is clear: we're all worthless. I mean, look at us, stacked up on each other like a can of processed potato chips. How's that for worth? "Hey, Tim!" I recognized that voice. It was Tony, a green, $50 chip who grew up in a swanky casino. He worked some of the best tables, for the highest rollers. You know, the big leagues. People in those places don't even bother with $5 chips like me. $50 was their common currency, and Tony had a good life there. But then some forgetful patron forgot to take him out of his pocket when cashing in his winnings. He eventually fell out in a public laundry, where he was promptly thrown away. Had to dig himself out of the trash, quite literally. And now he's here. With the rest of us, struggling to stay on top of the pile. "Tony," I called back to him, "What are you doing up this late?" "Considering my previous existence," he responded. "Pretty depressing when you think about it." "Yeah," I mused to myself. "...Yeah." I began to climb to the top of my pile. I heard the various grunts and briefs cries of pain. I was probably stepping on somebody's eyeball, or maybe sticking my foot in their mouth. That used to bother me. It doesn't anymore. We stack so high up, and we're all looking in different directions; it's nearly impossible not to dig your foot into somebody's personal space. Plus, I've been at the bottom of the pile before; I've been on the receiving end myself. My sympathy has its limits. I got to the top of my stack and lay down. I tucked my legs and arms in; a tricky maneuver, but very much worth it. I mean, just look at Rich. That blue son-of-a-gun makes his living in some seedy underground poker joints. Spends half his time in a pint of warm beer, dropped by a clumsy hand. He gets back to the neighborhood every day, drunk as a skunk (I'm assuming they get quite drunk), yells up a storm, and then collapses at the top of his pile. He always stays on the top, too. Nobody wants to be above him. All the other blues just walk around the blackjack tables when he's around. Must be the smell. Maybe I should try that. Keep me from having a bunch of lousy chips on top of me. "Don't sleep too late," said Mikhail, a friendly chip from the black pile, "I heard there might be work available tomorrow." "Huh." Wouldn't that be nice. The roulette table was one of those easy gigs that didn't take much beyond recognizing numbers. You know what a "24" is? Good; get over to it, and you're done. If it was actually available. Mikhail was friendly, but not all that bright. Too many times getting cashed in, if you know what I mean. "Thanks, Mik." "WILL YOU TWO SHUT UP?!" screeched a voice from across the way, "SOME PEOPLE ARE TRYING TO SLEEP!!" "Oh, speak for yourself, you purple elitist!" snapped Sharla, a feisty little green chip that I fated for a few months. "You're louder than anyone else here. Just because you have a bigger number on your back doesn't mean you're any better than the rest of us!" I suddenly remembered why I liked her. "I've got nothing to say to you," she bit back. I suddenly remembered why I didn't like her. 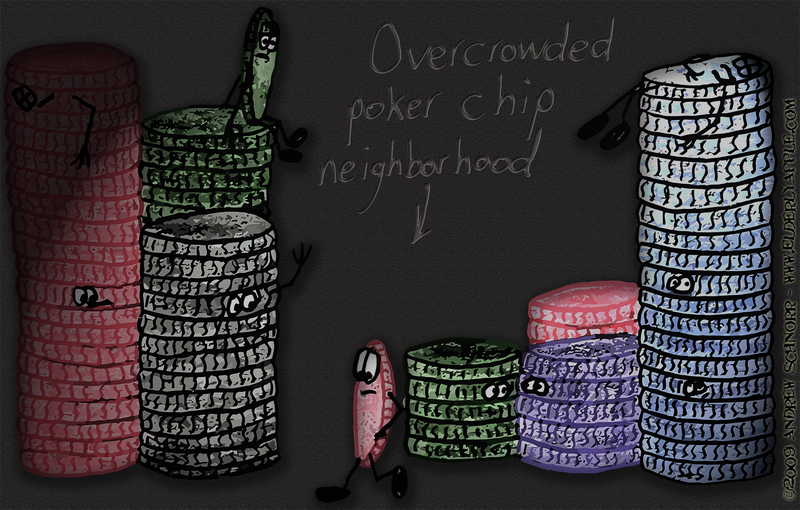 "Don't worry, Tim," said Lance, the red chip right beneath me, "Pretty soon, we'll have enough to get out of here. Find our own place. No crowds, no stacks. There'll be space for us to move. To be free. You know? It'll be great, Tim, it'll be great! We won't live in this depressing place anymore. We won't be..." he started crying. "Sure thing, Lance. Sure thing. Let's just hope that roulette table's open tomorrow." "One more thing, Tim," Lance croaked, holding back the tears. "Would you mind shifting your leg a bit? Your knee's sticking into where the sun don't shine. It's really depressing." I had a chance to save her. It was a brief chance (9.847 seconds, give or take), and my meansof saving them were obviously somewhat diminished by my lack of appendages or opposable thumbs. But a chance is a chance nonetheless. And as I float here, drifting at a speed of 2 feet-per-second (in relation to the nearest planet, which is probably contributing most of that relative speed), my thoughts drift themselves, going back to my memory of that event. "Oh, Support Bean 842," she said, "Is not cohesion wonderful? Is it not wonderful to be part of a single, undamaged vessel?" "Indeed it is, Support Beam 841." I had know Support Beam 841 for 0.3 Saturnian years (or, based on the standard Earth-based measurement, 8.837 years). We had practically left the factory simultaneously after production. And we'd served together on the same ship for the majority of that period. The only thing which had kept us from...touching...was Separator Plate 1129. I did not hold it against him - it was his occupation, after all - but it did make the past 7.12 years more uncomfortable for me. After all, how could I tell Support Beam 841 my feelings for her when I had never had a chance to have any personal contact with her? It was depressing, to say the least. Perhaps he was a mind reader, because Separator Plate 1129 then said to me, "Listen, hun, don't let me get in your way." He was right. "Support Beam 841, would you like to join me on a-"
ATTENTION ALL DECKS: BREACH IN ENGINEERING HULL 2. PREPARE FOR IMMINENT EXPLOSION. "What was that, Support Beam 842?" Support Beam 841 said in an unusually-panicked voice. "It is difficult to be sure, Support Beam 841! It seems as though the ship is becoming unstable." And it was. Bolts flying across the room, red lights flashing all over, precious air and artificial gravity being sucked into the coid outside. ATTENTION ALL DECKS: BREACHES IN ALL SECTORS. CORE EXPLOSION IN PROCESS. SALVATION IS GONE. 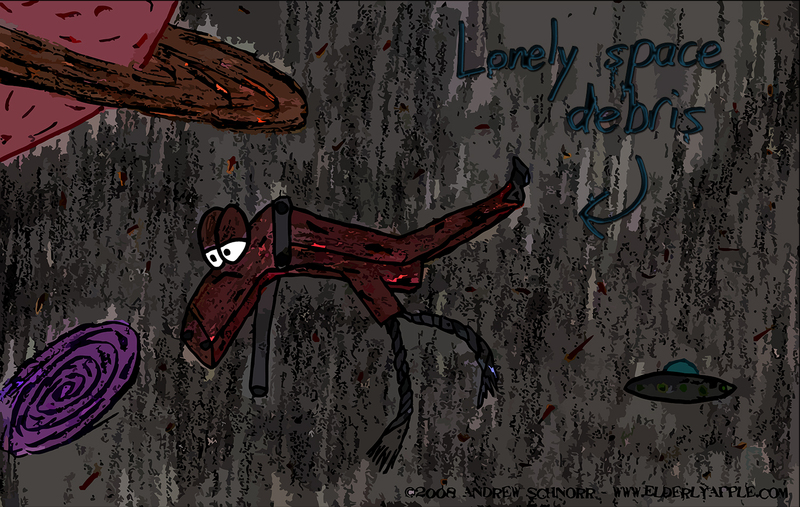 Separator Plate 1129 was ripped from his position, and began to fly towards a fate unknown. "Aw, sh-"
And that was it. I suppose there was an explosion, but I could not hear it. I could not hear anything. I could only see...but I could see everything. I could see the ship I had served on for 7.12 years explode into 834,796 differently sized pieced. I could see the tears of pain flow from some of the hull pieces as they were rent in two. I could see the tears of bolts as they were forcibly separated from the nuts they had hugged for so long. I could see my own tears well up and drip towards Support Beam 841, who was flying a direction opposite from me. I had already wasted 5.113 seconds in this stupor. I noticed exposed cable coming from the both of us. "Grab on, Support Beam 841!" I twisted my body as far as it would go, trying to get my exposed cables intertwined with her own. It was a crude pan, but nobody would have cared, so long as it worked. It didn't work. The frayed ends of our cables came within 0.64 centimeters of each other, but missed. As I continued spinning due to my own momentum, I could see Support Beam 841 say to me , "Goodbye, Support Beam 842. Goodbye." That was 4.85 Saturnian years (142.881 Earth standard years) ago. I am now alone. Even though there were 834,795 other members of my ship, some of which were only moving a few minutes of a degree different in their trajectory, the years hae turned the centimeters into miles. And of course, Support Beam 841 was moving in the exact opposite direction. She's the furthest away (assuming a common, constant velocity for all pieces involved). If any are still within eyesight, I cannot tell them from the rest of the cosmic dust, nor from the flakes of rust that come off of me when I cry. For a while, I had considered using my name, despite the fact that I was not supporting anything, I was only partially a beam, and I was the only one of my type. I'm not sure why. Perhaps I had hope that I would somehow find myself in an improbable wormhole which would somehow rejoin me with Support Beam 841, and, if nothing else, we could support each other. But I've long since stopped waiting for such fantasies to come true. After all, the longer one waits for a fantasy, the more depressing it seems. My only dream now is to cross paths with a halfway-decent planet, so that when I burn up upon entry into the atmosphere, there might be a sentient life to point up to the sky and wish upon my burning corpse. For I am Space Debris. January 12. That's the day she walked into my office. I was doing the crosswords in my newspaper. 39-Across. Ten letters. Adjective that would describe a group of homeless puppies. Then, a knock at the door. Before I could even invite her in, the dor was open, and there she was, as gorgeous as if she came straight from the chocolatier. Golden, puffy body, 90% dark chocolate dripping down, with just a hint of creamy filling peeking out the sides. What a looker. Mama always told me to stay away from the profiteroles. Too sweet to not be trouble. I should have listened to Mama. "I've got a problem, Detective Snickerdoodle," she said as she placed her dark brown high-heel on my desk, exposing a healthy portion of her long, stick-like leg. "You're not the only one, sister," I said, gulping back a ball of saliva. She leaned in closer, and I could smell her lemony filling. She shot me a cold gaze, "My husband's been murdered." I sat back and popped a sad-looking lolipop into my mouth. "I see," I said coolly, leaning back in my chair. "Any idea who might be responsible?" "Really? What type? Rose? Daffodil? Wolfsbane?" I immediately shot up in my chair. She wasn't talking about some two plant. No, she was talking about the bag of flour that's been terrorizing the city. He's been a problem for months. Suddenly, he was my problem. I picked up my phone. "Get me Captain Chocolate Chunk, of the police!" I used to serve under Captain Chunk back when I was on the force, before I got kicked off for my...troubles. A haggard cough greeted me on the other end. "Chunk, it's Snickerdoodle. I know we didn't part on the best of terms, but I need your help catching the bag of flour, so I can impress this crazy dame." "Hey!" said the profiterole, unamused by my misogyny. Two hours and 6 shots later, the chief and I were sitting in the back of a seedy bar. It seemed like we were the only ones in the establishment not crying into our drinks. The chief downed another bottle of whiskey and tossed it aside. It shattered upon a mourner in the corner. He put his handcuffs on the table, "Tell, me, Snickerdoodle, we're technically on opposite sides of the law now. 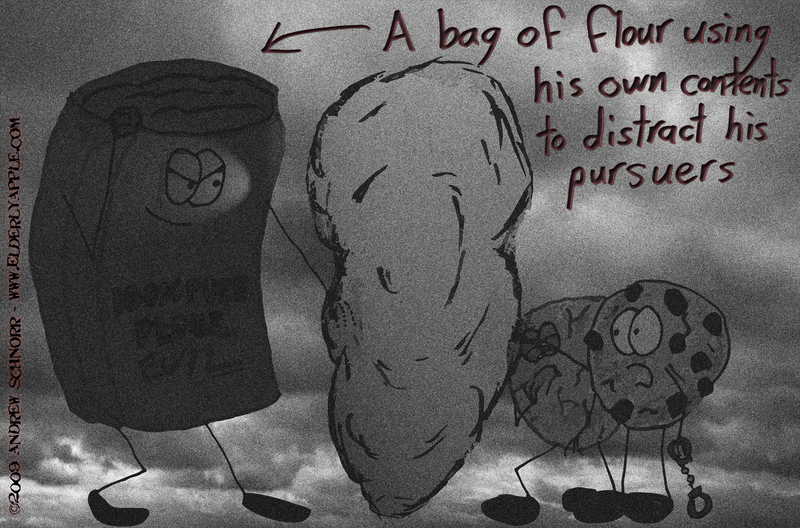 Why would you want my help bringing down this scumbag, excuse me, this flour bag?" "Chunk, this is beyond the past. I know the criminal mind. You know how to put them away. Not a perfect relationship, but it works." "You say you know the criminal mind. So what are we doing in this sorry dive?" "Because," a sinister voice said, "He knew I'd be here." We both looked up. Standing at the end of the table was a tall, pale-blue bag, on which was written "100% Pure Flour Evil". This was it. We'd found our man. "Why'd you kill the old eclair?" I said, my eyes firmly affixed to his. "Was it money? Jealousy? Rage? Or are you just plain-old crazy?" I took out my icing gun and pointed it at his face. "Don't do it, Snickerdoodle," the chief said to me in a grave tone, "Else I'd have to put you away. Let me take him in. Let's do this right...for once." "I'm not going anywhere!" And with that, the bag reached into his top, pulled out a clump of some flour-like substance (most likely flour), and dashed it to to the ground. A white clouds emerged, caking my throat and obscuring my vision. When the poweder finally settled, the bag was gone. "Forget him, Snickerdoodle," the chief said, pocketing his handcuffs. "He's gone." "Go frost yourself, Chunk!" I ran out and tried to catch the criminal. He wasn't difficult to track; just track the white, powdery footprints, footprints which led...to my office? The door was ever so slightly ajar, the wood around the doorknob cracked and splintered. I started breaking into a sweat as I took out my icing gun. "If you can hear me, flour bag, you're already iced!" I swung open the door, and what I saw made me sick to my stomach. It was a glass of milk. A horrible site any day, but inside this one was an attractive-looking profiterole. Not moving. Cold. Dead. In the corner of the room, was lemony cream filling sprawled into a message on the wall, saying "I WAS KILLED BY DETECTIVE SNICKERDOODLE." I'd been set up. Framed. "What a depressing development!" I screamed aloud. I took a handful of flour and tossed it out my window. The winter breeze blew it down the street into the horizon. I soon followed. ....And that is why I stick to just the drawing. Thanks for reading this 900th idea, and have a depressing day! Also, believe it or not, we're in the home stretch, people! You write good comedy, sir. That was excellent! I don't know what it's more like: Blade Runner or Dr. Strangelove. Enjoyed each one. Never knew so much background was going on in each of these daily comics! I liked it, despite the typos. But those don't matter, good story telling does, and that's what stands out here. Only you would come up with these sorts of stories. Oh and by the way, what's up with using my birthday in the 3rd story? eery coincidence no?